WARNING: This product contains an unknown dose of arecoline, a nicotine-like ingredient that comes from the addictive betel nut plant and is known to be a carcinogen at some dosage in both humans and mice. If you are going to use this product, we highly recommend reading the post linked above first so that you fully know what you're getting yourself into. 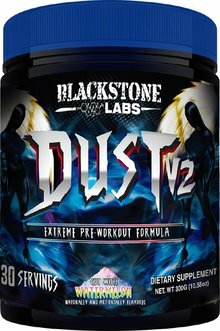 Two years ago, Blackstone Labs brought the supplement industry to its knees with the strongest, most potent preworkout formula of All-Time…Angel Dust! Angel Dust not only led the category, but reinvented how bodybuilders, athletes, and formulators would look at preworkout supplementation. For normal supplement companies a game changer only comes along once a decade, if they're lucky. For Blackstone Labs, it's a habit. Which is exactly why after two years we've upped the ante on our own #1 preworkout supplement. Why did we do that? Because you're either getting better or you're getting worse. Maintaining is for losers. It's time for DUST! Hair on fire, eyes bugging out of your head, psycho intensity in just ONE scoop. Explosive strength and power, extreme energy, endurance, and fire hose sized veins and pumps. We took all of the feedback from Angel Dust, analyzed the most up-to-date research in the field, and catered toward what you, the athlete, needs to drink for optimal performance. There's no fillers or junk, but simply the best tasting, highest quality ingredients available on the market. You can't have the most potent products in the industry and go half-assed on the formula. That means none of the side-effects you hate like cramping, anxiety, or trips to the restroom 10 minutes into your workout. If you thought that the original Angel Dust with Hype was a sick combo, Dust V2 works even better with our Nitrious Oxide Booster. Assess your tolerance, ladies and gentleman. Dust is not for the faint of heart. 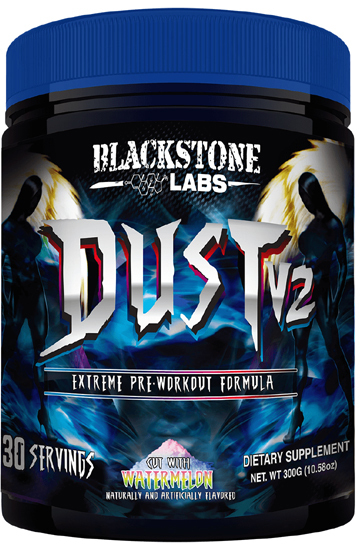 We 100% guarantee once you start on Dust, you won't "try out" another pre-workout ever again. Thought you couldn't have better workouts than you did on the original formula? Try again my friends, Dust is about to blow your mind! Strength, endurance, power, and pumps – nothing else matters in a workout! L-Norvaline is a form of the branched chain amino acid known as Valine, and while showing some of the nutritional benefits of Valine, L-Norvaline has also been suggested to help support circulation and cardiovascular efficiency. During exercise, it is important to maximize blood flow so that nutrient-rich blood flows to the active muscle tissues. When there isn't enough blood flow to specific areas, you will feel it in the form of fatigue and muscle failure. Acofuel improves athletic performance, energy, and mood. Note: This is typically spelled as "ArcoFuel" and contains arecoline / betel nut, a hazardous and addictive ingredient. Please click the link and do your research before purchasing. Yohimbine Bark (Std 10%) can lead to increased fat loss especially in "trouble areas" such as the midsection and love handles for men and glutes and thighs for women. Yohimbine can also support sense of well-being and mood and suppress your appetite. In its herbal form, yohimbe has been used for centuries as a performance enhancer and stimulant.